E-cigarettes are gaining popularity, and they’re prompting all sorts of public health questions. A lot of the concern revolves around kids and teens, especially since nicotine may have long-term consequences for their still-developing brains and most people who become smokers start as adolescents. Some health officials worry that e-cigarettes are being marketed to young people, and the FDA recently issued warning letters to several companies that were selling the liquids used in e-cigarettes with packaging that seemed to be aimed at kids — the containers resembled juice boxes or featured cartoony drawings. One high school in Annapolis, Maryland, even went so far as to remove the doors from some bathrooms to discourage students from “vaping,” as e-cigarette use is called. So, how harmful are e-cigarettes and vaping? It depends on the role you think they play. 1) Are e-cigarettes a safer way to consume nicotine? About 37.8 million adults smoke in the U.S., and e-cigarettes may provide a safer way for them to get their fix. Still, for people who aren’t interested in giving up nicotine, e-cigarettes could be a way to make their drug of choice less risky. Most of the risks from smoking come from the smoke, and there’s debate about whether nicotine itself poses major health risks or if its risks are more akin to those of another common stimulant: caffeine. 2) Can e-cigarettes be used as tools to help smokers quit? One of the most appealing ways that e-cigarettes could be used is as an aid to stop smoking. Ideally, in this scenario, smokers would give up tobacco cigarettes and use e-cigarettes to wean themselves off of nicotine altogether. Some types of e-cigarettes allow users to control the amount of nicotine they’re consuming, which provides a way to taper the dose and quit gradually. 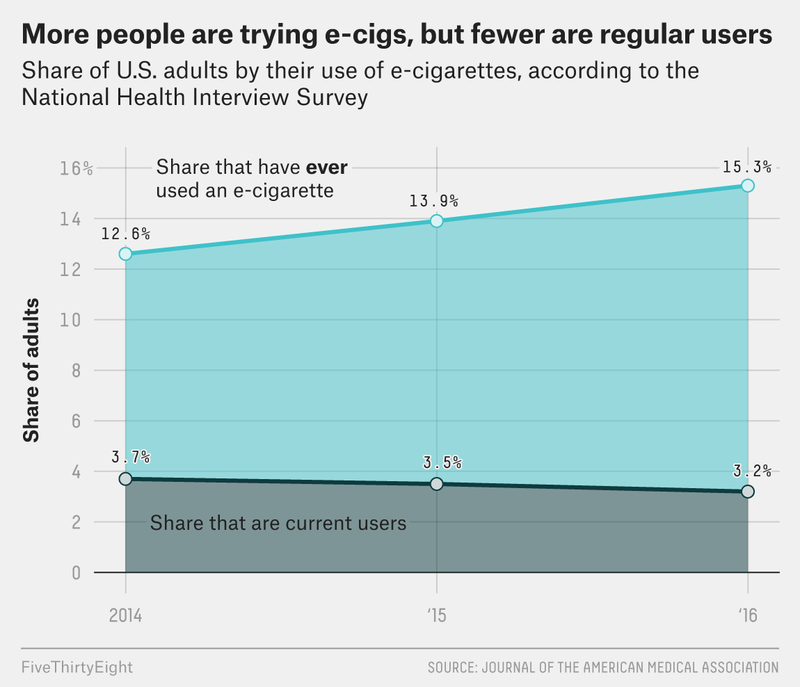 But the evidence that e-cigarettes really helps smokers quit is still pretty sparse. “Overall, there is limited evidence that e-cigarettes may be effective aids to promote smoking cessation,” the National Academies of Sciences report said. The report does note that observational studies, which look for differences between groups without asking participants to change their behavior or randomizing who’s in what group, suggest that the devices can be helpful for quitting, but these types of studies provide less reliable evidence than controlled trials. In other words: We need more research before we know an answer. 3) Are e-cigarettes a gateway to smoking? In 2005, nearly 21 percent of the U.S. population smoked. By 2016, that number had dropped to less than 16 percent. That’s a big public health win, but it could easily be dismantled if e-cigarettes end up recruiting a new generation of smokers. The National Academies of Sciences report concluded that adolescents who use e-cigarettes are more likely to try smoking than other kids, but we don’t know yet whether they then go on to become long-term smokers. Adolescents who try e-cigarettes are probably the same kids who would already try smoking, so it’s not clear from those numbers whether vaping is driving young people to smoke. New figures published earlier this month in the Journal of the American Medical Association showed that although the percentage of people who had tried e-cigarettes increased from 2014 to 2016, the percentage of people who regularly used e-cigarettes dropped by a sliver during that same time period. That suggests that some of these new users are simply trying e-cigarettes without taking them up as a habit. What’s more, the percentage of people in the U.S. who smoked fell from 16.8 percent in 2014 to 15.5 percent in 2016. Which means that if e-cigarettes are creating more smokers, their numbers are thus far offset by people who are quitting. So, in the short term, e-cigarettes seem likely to reduce smoking. But to really judge whether they’re more or less harmful than cigarettes, we need to assess their long-term effects. It’s possible that they’ll create more new smokers than they’ve eliminated, but it’s still too soon to tell what proportion of people who start using nicotine by vaping will convert to smoking. Some of what happens next depends on what regulators decide to do about e-cigarettes. The FDA has begun looking into the devices, but it is is still working on product standards that would protect against known safety issues like exploding devices and address “concerns about children’s exposure to liquid nicotine.” The agency recently asked Juul, a brand of e-cigarette popular with minors, to turn over information the agency hopes to use to understand why the company’s products have caught on among that demographic. And then there’s the other big factor that could influence what happens with e-cigs: cultural norms around vaping. If there’s one lesson to take from decades of tobacco marketing, it’s that advertising works, so the way in which these products are promoted could shape how they’re used. Social media is probably helping to spread photos of vaping and popular products like Juul. As Jia Tolentino wrote recently at The New Yorker, “The omnipresence of Juul on social media has undoubtedly made kids overestimate the extent of teen Juuling — young people tend to think that their peers drink, smoke, and hook up more than they actually do.” But teens have also formed groups that aim to prevent e-cigarette use, and it’s hard to say yet whether e-cigarettes will be a passing fad among kids or a new lifelong habit that gets people hooked on nicotine.